Last week, Google Places features added to other features to help businesses create a directory page on Google. 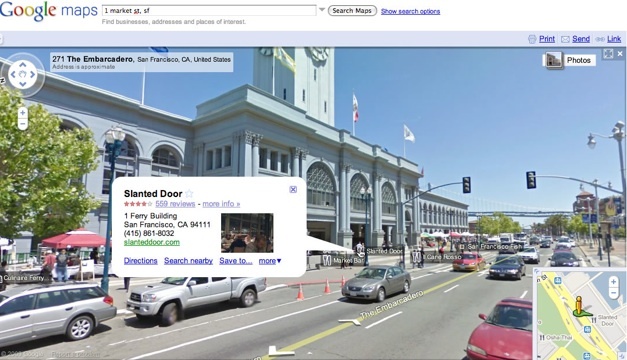 Today, Google's Street View to join the show links to local business listings on Google Street View. When we look at the "Street View", the names of local businesses and "Google Places" will show the picture from the top of the buildings. When we turn on these names will display a small window showing the list binis details such as name, phone number and rating. There is already a link from the list of businesses on Google Maps to Street View for almost a year, but now the list of business will be visible in Street View itself. In the future, we can expect to see the Street View on a mobile augmented reality, namely by simply directing camera phone into a building then we can see a list of businesses in it. We all waited for the presence of Augmented Reality in the future.